Motor School - Motor Manufacturing Companies in India, Induction Motor, Three Phase Motor, Squirrel Cage Induction Motor, Electric Motor, VFD, Roller Table Motors, Crane Duty Motors, Hoist Duty Motors, Prime Mover, Speed Variation Motor. An induction motors consists of stator winding and short circuited rotor. The stator winding is housed in stator slots of laminated core made of electrical grade steel. The rotor is either aluminium die-cast into rotor core or copper bars housed in the slots of rotor core. When connected to a three phase power supply, the stator winding produces a magnetic field. The speed at which the rotating magnetic field rotates is called synchronous speed. It depends on frequency of the supply and the number of poles for which the stator is wound. In order to induce current in the rotor and produce torque the rotating field must rotate faster than the rotor. As the rotor picks up speed the above difference is reduced and rotor current also reduces. The rotor stabilizes at a speed where motor torque equals to load torque. Because motor torque varies with speed the relation ship between torque and speed are shown as a graph called torque-speed curve. Various types of AC induction motors are available in the market. Different motors are suitable for different applications. Although AC induction motors are easier to design than DC motors, the speed and the torque control in various types of AC induction motors require a greater understanding of the design and the characteristics of these motors. 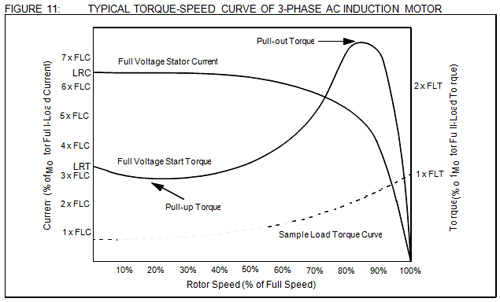 This application note discusses the basics of an AC induction motor; the different types, their characteristics, the selection criteria for different applications and basic control techniques. Virtually all electrical motors use magnetic field rotation to spin their rotors. A three-phase AC induction motor is the only type where the rotating magnetic field is created naturally in the stator because of the nature of the supply. DC motors depend either on mechanical or electronic commutation to create rotating magnetic fields. A single-phase AC induction motor depends on extra electrical components to produce this rotating magnetic field. Two sets of electromagnets are formed inside any motor. In an AC induction motor, one set of electromagnets is formed in the stator because of the AC supply connected to the stator windings. The alternating nature of the supply voltage induces an Electromagnetic Force (EMF) in the rotor (just like the voltage is induced in the transformer secondary) as per Lenz's law, thus generating another set of electromagnets; hence the name induction motor. Interaction between the magnetic field of these electromagnets generates twisting force, or torque. As a result, the motor rotates in the direction of the resultant torque. The stator is made up of several thin laminations of aluminum or cast iron. They are punched and clamped together to form a hollow cylinder (stator core) with slots as shown in Figure 1. Coils of insulated wires are inserted into these slots. Each grouping of coils,together with the core it surrounds, forms an electromagnet (a pair of poles) on the application of AC supply. The number of poles of an AC induction motor depends on the internal connection of the stator windings. The stator windings are connected directly to the power source. Internally they are connected in such away, that on applying AC supply, a rotating magnetic field is created. The rotor is made up of several thin steel laminations with evenly spaced bars, which are made up of aluminum or copper, along the periphery. In the most popular type of rotor (squirrel cage rotor), these bars are connected at ends mechanically and electrically by the use of rings. Almost 90% of induction motors have squirrel cage rotors. This is because the squirrel cage rotor has a simple and rugged construction. The rotor consists of a cylindrical laminated core with axially placed parallel slots for carrying the conductors. Each slot carries a copper, aluminum, or alloy bar. These rotor bars are permanently short-circuited at both ends by means of the end rings, as shown in Figure 2. This total assembly resembles the look of a squirrel cage, which gives the rotor its name. The rotor slots are not exactly parallel to the shaft. Instead, they are given a skew for two main reasons. The first reason is to make the motor run quietly by reducing magnetic hum and to decrease slot harmonics. The second reason is to help reduce the locking tendency of the rotor. The rotor teeth tend to remain locked under the stator teeth due to direct magnetic attraction between the two. This happens when the number of stator teeth are equal to the number of rotor teeth. The rotor is mounted on the shaft using bearings on each end; one end of the shaft is normally kept longer than the other for driving the load. Some motors may have an accessory shaft on the non-driving end for mounting speed or position sensing devices. Between the stator and the rotor, there exists an air gap, through which due to induction, the energy is transferred from the stator to the rotor. The generated torque forces the rotor and then the load to rotate. Regardless of the type of rotor used, the principle employed for rotation remains the same. The magnetic field created in the stator rotates at a synchronous speed (NS). The magnetic field produced in the rotor because of the induced voltage is alternating in nature. To reduce the relative speed, with respect to the stator, the rotor starts running in the same direction as that of the stator flux and tries to catch up with the rotating flux.However, in practice, the rotor never succeeds in "catching up" to the stator field. The rotor runs slower than the speed of the stator field. This speed is called the Base Speed (Nb). There are probably more single-phase AC induction motors in use today than the total of all the other types put together. It is logical that the least expensive,lowest maintenance type motor should be used most often. The single-phase AC induction motor best fits this description. As the name suggests, this type of motor has only one stator winding (main winding) and operates with a single-phase power supply. In all single-phase induction motors, the rotor is the squirrel cage type. The single-phase induction motor is not self-starting. When the motor is connected to a single-phase power supply, the main winding carries an alternating current. This current produces a pulsating magnetic field. Due to induction, the rotor is energized. As the main magnetic field is pulsating, the torque necessary for the motor rotation is not generated. This will cause the rotor to vibrate, but not to rotate. Hence, the single phase induction motor is required to have a starting mechanism that can provide the starting kick for the motor to rotate. The starting mechanism of the single-phase induction motor is mainly an additional stator winding (start/ auxiliary winding) as shown in Figure 3. The start winding can have a series capacitor and/or a centrifugal switch. When the supply voltage is applied, current in the main winding lags the supply voltage due to the main winding impedance. At the same time, current in the start winding leads/lags the supply voltage depend- ing on the starting mechanism impedance. Interaction between magnetic fields generated by the main wind- ing and the starting mechanism generates a resultant magnetic field rotating in one direction. The motor starts rotating in the direction of the resultant magnetic field. Once the motor reaches about 75% of its rated speed,a centrifugal switch disconnects the start winding. From this point on, the single-phase motor can maintain sufficient torque to operate on its own. Except for special capacitor start/capacitor run types,all single-phase motors are generally used for applications up to 3/4 hp only. Depending on the various start techniques, single phase AC induction motors are further classified as described in the following sections. 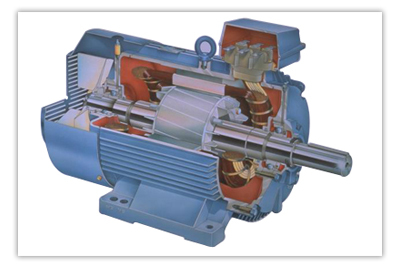 The split-phase motor is also known as an induction start/induction run motor. It has two windings: a start and a main winding. The start winding is made with smaller gauge wire and fewer turns, relative to the main winding to create more resistance, thus putting the start winding's field at a different angle than that of the main winding which causes the motor to start rotating. The main winding, which is of a heavier wire, keeps the motor running the rest of the time. The starting torque is low, typically 100% to 175% of the rated torque. The motor draws high starting current, approximately 700% to 1,000% of the rated current. The maximum generated torque ranges from 250% to 350% of the rated torque (see Figure 9 for torque-speed curve). This is a modified split-phase motor with a capacitor in series with the start winding to provide a start "boost".Like the split-phase motor, the capacitor start motor also has a centrifugal switch which disconnects the start winding and the capacitor when the motor reaches about 75% of the rated speed. Since the capacitor is in series with the start circuit, it	creates more starting torque, typically 200% to 400% of the rated torque. And the starting current, usually 450% to 575% of the rated current, is much lower than the split-phase due to the larger wire in the start circuit. Refer to Figure 9 for torque-speed curve.A modified version of the capacitor start motor is the resistance start motor. In this motor type, the starting capacitor is replaced by a resistor. The resistance start motor is used in applications where the starting torque requirement is less than that provided by the capacitor	start motor. Apart from the cost, this motor does not offer any major advantage over the capacitor start motor. They are used in a wide range of belt-drive applications like small conveyors, large blowers and pumps, as well	as many direct-drive or geared applications. A permanent split capacitor (PSC) motor has a run type capacitor permanently connected in series with the start winding. 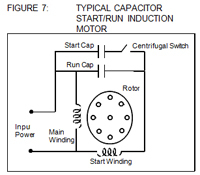 This makes the start winding an auxiliary winding once the motor reaches the running speed.Since the run capacitor must be designed for continu- ous use, it cannot provide the starting boost of a starting capacitor. The typical starting torque of the PSC motor is low, from 30% to 150% of the rated torque. PSC motors have low starting current, usually less than 200% of the rated current, making them excellent for applications with high on/off cycle rates. 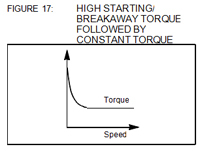 Refer to Figure 9 for torque speed curve. The PSC motors have several advantages. The motor design can easily be altered for use with speed controllers. They can also be designed for optimum efficiency and High-Power Factor (PF) at the rated load. They're considered to be the most reliable of the single-phase motors, mainly because no centrifugal starting switch is required. Permanent split-capacitor motors have a wide variety of applications depending on the design. These include fans, blowers with low starting torque needs and intermittent cycling uses, such as adjusting mechanisms,gate operators and garage door openers. This type of motor can be designed for lower full-load currents and higher efficiency (see Figure 9 for torque- speed curve). This motor is costly due to start and run	capacitors and centrifugal switch. It is able to handle applications too demanding for any other kind of single-phase motor. These include wood- working machinery, air compressors, high-pressure water pumps, vacuum pumps and other high torque applications requiring 1 to 10 hp. 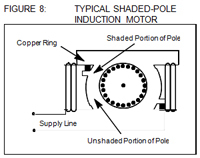 Shaded-pole motors have only one main winding and no start winding. Starting is by means of a design that rings a continuous copper loop around a small portion of each of the motor poles. This "shades" that portion of the pole, causing the magnetic field in the shaded area to lag behind the field in the unshaded area. The reaction of the two fields gets the shaft rotating. Because the shaded-pole motor lacks a start winding, starting switch or capacitor, it is electrically simple and inexpensive. Also, the speed can be controlled merely by varying voltage, or through a multi-tap winding. Mechanically, the shaded-pole motor construction allows high-volume production. In fact, these are usually considered as "disposable" motors, meaning they are much cheaper to replace than to repair. The shaded-pole motor has many positive features but it also has several disadvantages. It's low starting torque is typically 25% to 75% of the rated torque. It is a high slip motor with a running speed 7% to 10% below the synchronous speed. Generally, efficiency of this motor type is very low (below 20%). The low initial cost suits the shaded-pole motors to low horsepower or light duty applications. Perhaps their larg- est use is in multi-speed fans for household use. But the low torque, low efficiency and less sturdy mechanical features make shaded-pole motors impractical for most industrial or commercial use, where higher cycle rates or continuous duty are the norm. 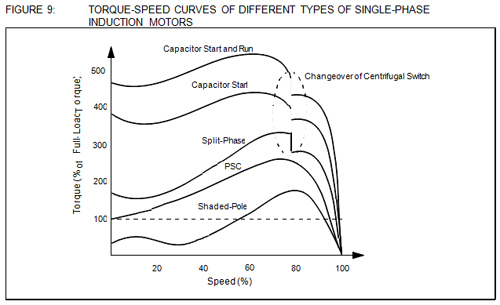 Figure 9 shows the torque-speed curves of various kinds of single-phase AC induction motors. Three-phase AC induction motors are widely used in industrial and commercial applications. They are classified either as squirrel cage or wound-rotor motors.These motors are self-starting and use no capacitor,start winding, centrifugal switch or other starting device. They produce medium to high degrees of starting torque. The power capabilities and efficiency in these motors range from medium to high compared to their single-phase	counterparts. Popular applications include grinders, lathes, drill presses, pumps,compressors, conveyors, also printing equipment, farm equipment, electronic cooling and other mechanical duty applications. Almost 90% of the three-phase AC Induction motors are of this type. Here, the rotor is of the squirrel cage type and it works as explained earlier. The power ratings range from one-third to several hundred horse- power in the three-phase motors. Motors of this type,rated one horsepower or larger, cost less and can start heavier loads than their single-phase counterparts. The slip-ring motor or wound-rotor motor is a variation	of the squirrel cage induction motor. While the stator is the same as that of the squirrel cage motor, it has a set of windings on the rotor which are not short-circuited, but are terminated to a set of slip rings. These are helpful in adding external resistors and contactors. The slip necessary to generate the maximum torque(pull-out torque) is directly proportional to the rotor resistance. In the slip-ring motor, the effective rotor	resistance is increased by adding external resistance through the slip rings. Thus, it is possible to get higher slip and hence, the pull-out torque at a lower speed. A particularly high resistance can result in the pull-out torque occurring at almost zero speed, providing a very high pull-out torque at a low starting current. As the motor accelerates, the value of the resistance can be reduced, altering the motor characteristic to suit the load requirement. Once the motor reaches the base speed, external resistors are removed from the rotor.This means that now the motor is working as the standard induction motor. This motor type is ideal for very high inertia loads,where it is required to generate the pull-out torque at almost zero speed and accelerate to full speed in the minimum time with minimum current draw. The downside of the slip ring motor is that slip rings and brush assemblies need regular maintenance, which is a cost not applicable to the standard cage motor. If the rotor windings are shorted and a start is attempted (i.e., the motor is converted to a standard induction motor),it will exhibit an extremely high locked rotor current typically as high as 1400% and a very low locked rotor torque, perhaps as low as 60%. In most applications, this is not an option. Modifying the speed torque curve by altering the rotor resistors, the speed at which the motor will drive a particular load can be altered. At full load, you can reduce the speed effectively to about 50% of the motor synchronous speed, particularly when driving variable torque/variable speed loads, such as printing presses or compressors.Reducing the speed below 50% results in very low efficiency due to higher power dissipation in the rotor resistances. This type of motor is used in applications for driving variable torque/ variable speed loads, such as in printing presses,compressors, conveyer belts, hoists and elevators. The motor load system described by a fundamental torque equation. This shows that the torque developed by the motor is counter balanced by a load torque,Tl and a dynamic torque,J(d⌉m/dt). The torque component,J(d⌉/dt),is	called the dynamic torque because it is present only during the transient operations. The drive accelerates or decelerates depending on whether T is greater or	less than Tl. D	uring acceleration, the motor should supply not only the load torque, but an additional torque component,J(d⌉m/dt),in order to overcome the drive inertia. In drives with large inertia, such as electric trains, the motor torque must exceed the load torque by	a large amount in order to get adequate acceleration. In drives requiring fast transient response, the motor torque should be maintained at the highest value and the motor load system should be designed with the lowest possible inertia. The energy associated with the dynamic torque,J(d⌉m/dt),is stored in the form of kinetic energy (KE) given by,J(⌉2m/2). During deceler	ation, the dynamic torque, J(d⌉m/dt), has a negative sign. Therefore, it assists the motor developed torque T and maintains the drive motion by extracting energy from the stored kinetic energy. To summarize, in order to get steady state rotation of the motor, the torque developed by the motor (T)should always be equal to the torque requirement of the load (Tl).The torque-speed curve of the typical three-phase	induction motor is shown in Figure 11. Induction motors, at rest, appear just like a short circuited transformer and if connected to the full supply voltage, draw a very high current known as the "Locked Rotor Current." They also produce torque which is known as the "Locked Rotor Torque". The Locked Rotor Torque (LRT) and the Locked Rotor Current (LRC) are a function of the terminal voltage of the motor and the motor design. As the motor accelerates, both the torque and the current will tend to alter with rotor speed if the voltage is maintained constant. The starting current of a motor with a fixed voltage will drop very slowly as the motor accelerates and will only begin to fall significantly when the motor has reached at least 80% of the full speed. The actual curves for the induction motors can vary considerably between designs but the general trend is for a high current until the motor has almost reached full speed. The LRC of a motor can range from 500% of Full-Load Current (FLC) to as high as 1400% of FLC. Typically, good motors fall	in the range of 550% to 750% of FLC. The starting torque of an induction motor starting with a fixed voltage will drop a little to the minimum torque, known as the pull-up torque, as the motor accelerates and then rises to a maximum torque, known as the breakdown or pull-out torque, at almost full speed and then drop to zero at the synchronous speed. 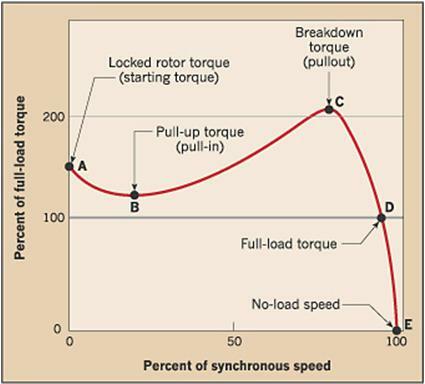 The curve of the start torque against the rotor speed is dependant on the terminal voltage and the rotor design. The LRT of an induction motor can vary from as low as 60% of FLT to as high as 350% of FLT. The pull-up torque can be as low as 40% of FLT and the breakdown torque can be as high as 350% of FLT. Typically, LRTs for medium to large motors are in the order of 120% of FLT to 280% of FLT. The PF of the motor at start is typically 0.1-0.25, rising to a maximum as the motor accelerates and then falling again as the motor approaches full speed. Once the motor is up to speed, it operates at a low slip,at a speed determined by the number of the stator poles. Typically, the full-load slip for the squirrel cage induction motor is less than 5%. The actual full-load slip of a particular motor is dependant on the motor design.The typical base speed of the four pole induction motor varies between 1420 and 1480 RPM at 50 Hz, while the synchronous speed is 1500 RPM at 50 Hz. The current drawn by the induction motor has two components: reactive component (magnetizing current) and active component (working current). The magnetizing current is independent of the load but is depen- dant on the design of the stator and the stator voltage.The actual magnetizing current of the induction motor can vary, from as low as 20% of FLC for the large two pole machine, to as high as 60% for the small eight pole machine. The working current of the motor is directly proportional to the load. The tendency for the large machines and high-speed machines is to exhibit a low magnetizing current, while for the low-speed machines and small machines the tendency is to exhibit a high magnetizing current. A typical medium sized four pole machine has a magnetizing current of about 33% of FLC. A low magnetizing current indicates a low iron loss,while a high magnetizing current indicates an increase in iron loss and a resultant reduction in the operating efficiency. Typically, the operating efficiency of the induction motor is highest at 3/4 load and varies from less than 60% for small low-speed motors to greater than 92% for large high-speed motors. The operating PF and efficiencies are generally quoted on the motor data sheets. In real applications, various kinds of loads exist with	different torque-speed curves. For example, Constant Torque, Variable Speed Load (screw compressors,	conveyors, feeders), Variable Torque, Variable Speed Load (fan, pump), Constant Power Load (traction drives), Constant Power, Constant Torque Load (coiler drive) and High Starting/Breakaway Torque followed by Constant Torque Load (extruders, screw pumps). The motor load system is said to be stable when the developed motor torque is equal to the load torque requirement. The motor will operate in a steady state at a fixed speed. The response of the motor to any disturbance gives us an idea about the stability of the	motor load system. This concept helps us in quickly evaluating the selection of a motor for driving a particular load. In most drives, the electrical time constant of the motor is negligible as compared to its mechanical time con- stant. Therefore, during transient operation, the motor can be assumed to be in an electrical equilibrium, implying that the steady state torque-speed curve is also applicable to the transient operation. As an example, Figure 12 shows torque-speed curves of the motor with two different loads. The system can be termed as stable, when the operation will be restored after a small departure from it, due to a disturbance in the motor or load. For example, disturbance causes a reduction of -⌉m in speed. In the first case, at a new speed, the motor torque (T) is greater than the load torque (Tl). Consequently, the motor will accelerate and the operation will be restored to X. Similarly, an increase of -⌉m	in the speed, caused by a disturbance, will make the load torque (Tl) greater than the motor torque (T), resulting in a deceleration and restoration of the point of operation to X. Hence, at point X, the system is stable. In the second case, a decrease in the speed causes the load torque (Tl) to become greater than the motor torque (T	), the drive decelerates and the operating point moves away from Y. Similarly, an increase in the speed will make the motor torque (T) greater than the load torque (Tl), which will move the operating point further away from Y. Thus, at point Y, the system is unstable. The torque required by this type of load is constant regardless of the speed. In contrast, the power is linearly proportional to the speed. Equipment, such as screw compressors, conveyors and feeders, have this type of characteristic. This is most commonly found in the industry and sometimes is known as a quadratic torque load. The torque is the square of the speed, while the power is the cube of the speed. This is the typical torque-speed characteristic of a fan or a pump. This type of load is rare but is sometimes found in the industry. The power remains constant while the torque varies. The torque is inversely proportional to the speed, which theoretically means infinite torque at zero speed and zero torque at infinite speed. In practice,there is always a finite value to the breakaway torque required. This type of load is characteristic of the traction drives, which require high torque at low speeds for the initial acceleration and then a much reduced torque	when at running speed. This is common in the paper industry. In this type of load, as speed increases, the torque is constant with the power linearly increasing. When the torque starts to decrease, the power then remains constant. This type of load is characterized by very high torque at relatively low frequencies. Typical applications include extruders and screw pumps. Worldwide, various standards exist which specify various operating and constructional parameters of a motor. The two most widely used parameters are the National Electrical Manufacturers Association (NEMA) and the International Electrotechnical Commission(IEC). NEMA sets standards for a wide range of electrical products, including motors. NEMA is primarily associ- ated with motors used in North America. The standards developed represent the general industry practices and are supported by manufacturers of electrical equipment. These standards can be found in the NEMA Standard Publication No. MG 1. Some large AC motors may not fall under NEMA standards. They are built to meet the requirements of a specific application. They are referred to as above NEMA motors. IEC is a European-based organization that publishes and promotes worldwide, the mechanical and electrical standards for motors, among other things. In simple terms, it can be said that the IEC is the international counterpart of the NEMA. The IEC standards are associated with motors used in many countries. These standards can be found in the IEC 34-1-16. The motors which meet or exceed these standards are referred to as IEC motors.The NEMA standards mainly specify four design types for AC induction motors Design A, B, C and D. Their typical torque-speed curves are shown in Figure 18. Design A has normal starting torque (typically 150-170% of rated) and relatively high starting current. The breakdown torque is the highest of all the NEMA types. It can handle heavy overloads for a short duration. The slip is <= 5%. A typical application is the powering of injection molding machines. Design B is the most common type of AC induction motor sold. It has a normal starting torque, similar to Design A, but offers low starting current. The locked rotor torque is good enough to start many loads encountered in the industrial applications. The slip is <= 5%. The motor effi- ciency and full-load PF are comparatively high,contributing to the popularity of the design. The typical applications include pumps, fans and machine tools. Design C has high starting torque (greater than the previous two designs, say 200%), useful for driving heavy breakaway loads like conveyors,crushers, stirring machines, agitators, reciprocat- ing pumps, compressors, etc. These motors are intended for operation near full speed without great overloads. The starting current is low. The slip is <= 5%. Design D has high starting torque (higher than all the NEMA motor types). The starting current and full-load speed are low. The high slip values (5-13%) make this motor suitable for applications with changing loads and subsequent sharp changes in the motor speed, such as in machinery with energy storage flywheels, punch presses, shears, elevators, extractors, winches, hoists, oil-well pumping, wire-drawing machines,etc. The speed regulation is poor, making the design suitable only for punch presses, cranes,elevators and oil well pumps. This motor type is usually considered a "special order" item. Recently,NEMA has added one more design. . Design E in its standard for the induction motor.Design E is similar to Design B, but has a higher efficiency, high starting currents and lower full-load running currents. The torque characteristics of Design E are similar to IEC metric motors of similar power parameters. The IEC Torque-Speed Design Ratings practically mirror those of NEMA. The IEC Design N motors are similar to NEMA Design B motors, the most common motors for industrial applications. The IEC Design H motors are nearly identical to NEMA Design C motors. 2 S2 Short-time duty Operation at constant load during a given time, less than required to reach the thermal equilibrium, followed by a rest enabling the machine to reach a temperature similar to that of the coolant (2 Kelvin tolerance). 3 S3 Intermittent periodic duty A sequence of identical duty cycles, each including a period of operation at constant load and a rest (without connection to the mains). For this type of duty, the starting current does not significantly affect the temperature rise. 4 S4 Intermittent periodic duty with starting A sequence of identical duty cycles, each consisting of a significant period of starting, a period under constant load and a rest period. 5 S5 Intermittent periodic duty with electric braking A sequence of identical cycles, each consisting of a period of starting, a period of operation at constant load, followed by rapid electric braking and a rest period. 6 S6 Continuous operation periodic duty A sequence of identical duty cycles, each consisting of a period of operation at constant load and a period of operation at no-load. There is no rest period. 7 S7 Continuous operation periodic duty with electric braking A sequence of identical duty cycles, each consisting of a period of starting, a period of operation at constant load, followed by an electric braking. There is no rest period. 9 S9 Duty with non-periodic load and speed variations Duty in which,generally, the load and the speed vary non-periodically within the permissible range. This duty includes frequent overloads that may exceed the full loads.